ARC Tracker - Fast, Easy, & Safe! I am a property manager, board member, or ARC member for my community and I am authorized to set up this ARC Tracker account for my community. 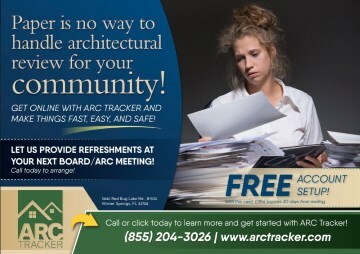 I am a homeowner whose community currently uses ARC Tracker. I want to submit or review an ARC request. Received a Special, Limited Time Offer in your Mail? Our Mission is to save time for everyone involved in Architectural Review while protecting the interests of all involved. Gone are the days of tedious paper requests, long waits for the ARC to meet, paper requests getting lost, irate homeowners having to call for the status of their request, and ARC meetings failing to act on requests because a quorum was not present. Process Requests in days instead of weeks or months. Never lose a request again! Make your ARC's job easier. Review and vote on requests anytime and from anywhere. Access archived requests 27/7/365. No more grainy paper prints. Upload and re-upload photos. Fully transparent process meets ALL statutory requirements. Homeowners are guided to submit more compliant requests. Let us provide refreshments and a demo at your next board or ARC meeting! "The system is easy to use. Our HOA has actually received compliments on how quickly requests are approved as a result of the new system." We offer paint selection online. Reminders sent to Homeowners and Committee Members when requests are late. We offer follow-up processing of requests AFTER the request is approved to help confirm completion of the work. Full e-mail and phone support. No more time-consuming, costly approval delays. Use our faster and more efficient solution to architectural review management. Reduce risk of homeowner challenges, lawsuits, and non-compliance. Save your staff time and effort. View ARC records 24/7/365 at home or on the road. Meet or exceed F.S. 720 requirements for architectural review. 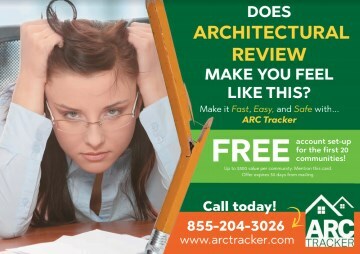 Sign Up For ARC Tracker Today! © 2018 ARC Tracker All rights reserved.